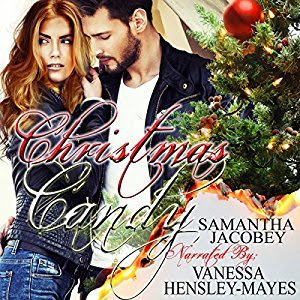 Christmas Candy (October 2015; ISBN12: 978-1535036597) is the first book in Samantha Jacobey's holiday-themed Sweet Christmas series. This short novella was published last year in ebook and print but it is now available in audiobook. Also recently published is book 2 - Christmas Eve. I listened to the audio version, which I received free from the publicist. I thought it would make the perfect book to listen to as I finished up the last days of work for 2016. The story is short - the audiobook is just over 3 hours. While the plot is your typical "girl has sworn off men, man will pursue woman regardless" story with some uniqueness sprinkled on top. Candy, who became pregnant at 15, is the single mother of a special needs child. She lives with her mother who was widowed several years before when her police husband was shot and killed in the line of duty. Gary is new at the local fire station and meets Candy when he stops in at the nearby convenience store where Candy works. He is taken with her and eventually asked her out, only to be turned down flat. I had high hopes that this would be the Christmas story I was looking for. It had the potential to be fun and flirty with a healthy dose of drama (there's a fireman, a fire, and a damsel in distress). However, the audiobook narrator grated on my nerves, immediately putting a damper on the story. She just didn't seem right for the project. The voice of Gary wasn't as deep or manly as I thought it should have been and I thought there were other places where the inflection was off. Perhaps if I had read the story for myself I would have found the story more fun, but as it was I struggled to finish it. I know that it is a novella, but I thought there was a lot of room for expansion and that details were glossed over that may have added depth to the story. Overall, it was an okay Christmas story. I would recommend reading the book instead of listening to the audiobook. Also as it is part of a series, there may be more character development and deepening of relationships as the series progresses.